From Dusk Till Dawn meets Shaun Of The Dead, this ends up being a very funny movie with a cool take on some conventional ideas. 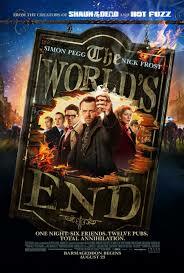 Just like the other movies in this trilogy (Shaun Of The Dead and Hot Fuzz), the worlds end is a very good film. It is funny and clever and has some pretty creative action. the premise involves a bunch of friends reuniting to try to take on a pub crawl challenge that they once tried when they were younger, (it all sounds a little like Hot Tub Time Machine, but in a good way.) The first half of the movie is all fun and jokes as the boys go from one pub to the next. the second half is when they deal with attacks by robots that look like humans. The pacing does get a little slow towards the end, but other than that, just about everything here works. The Worlds End is a success. I’m very happy to be able to say that, considering the possible doubt I was having beforehand. It’s not that I thought the movie looked bad or anything, I just wasn’t sure. I mean, this trio of 2 actors and their writer-director made two fantastic films before this. That trio is composed of actors Simon peg and nick frost, along with their writer-director, Edgar Wright. The movies were Shaun of the dead and hot fuzz, and both were pretty great. Hot fuzz, in particular, was just exceptional. But then some interesting things happened in the years that followed. Simon Peg and nick frost made a movie that they starred in together without Edgar Wright as director, and the movie sucked. That movie was called Paul, and it was a star-studded spectacle about an alien being. It had Kristen Wig, Bill Harder, Seth Rogen, Jason Bateman, and plenty of others. But it didn’t have Edgar Wright. And while that was happening, Wright went on to direct a movie without these actors. That movie was Scott Pilgrim vs. the World, and it was pretty good. So it was starting to seem like Wright was the element that glued all the pieces together and made them work, but there was also the chance that the time for these movies was in the past, and that they wouldn’t hold up as well today. The World’s End proves that they still do. It is exactly what it should be, which mainly means that it is a very funny film, with great action as well. It’s about as good as Shaun of the dead, but definitely not as great as hot fuzz. And that’s understandable. Like Shaun of the dead, this one is about a small town that gets taken over by creatures. In that movie it was zombies. Here, it’s robots that look like people. But this movie does something uniquely smart. It doesn’t bring the robots in until about halfway through the film. That’s the From Dusk Till Dawn method. The first half of that movie was a criminal getaway film, entirely realistic, to the point where it felt like a Tarantino movie (he wrote it). The second half brought in vampires and was more of a Robert Rodriguez film (he directed it.) and the coolest thing was that from the events of the first half, you could never see the second half coming. It was like two different movies in one. The world’s end is the exact same way. The first half is all comedy. Every bit of it. The story is about five friends who go out one night to try to conquer a challenge known as the golden mile. It’s twelve pubs in a small mile radius. The idea is to have one beer at each pub. Only this idea starts back when the guys were in their twenties. They were all good friends, and tried to conquer the challenge once before. We get to see a little bit of that at the start of the film, and the reasons why they never made it to the end. Now, it’s about twenty years later, and all the guys are serious in their lives. All of them except for Gary King (Simon Peg). He’s the ringleader who gets the band back together. He starts by speaking at a group therapy meeting about how great that night was. When someone sitting in the circle asks if he regrets that they didn’t finish, he gets the idea to try it again. That’s when Gary goes to see each of his friends, one at a time, and to make his declaration. He lays to each one of them about the who will be involved, and to the last one, Andy, he lies about his mom. Then come the meeting time and the beginning of their journey. They all meet up at a train station; with the four guys sitting they’re waiting until Gary arrives. He pulls up in his car, they all hop in, and they’re off. And it’s one pub after the next, just like they planned. The first two pubs look exactly the same on the inside, and that’s part of the humor, in talking about corporate sponsorship and the star bucks effect. The boys sit around and talk about each other’s lives, and at one point, one of their sister’s shows up. This is Sam, played by rosamund pike. Two of the guys develop an instant crush on her, and try to win her over, each in a very different way. And then the robots attack. It all starts with Gary in the men’s room, dealing with a kid who turns out to be a robot. Then it’s the whole group in that same men’s room, fighting against a whole group of robots. And Edgar Wright films it and cuts it perfectly, swinging his camera around, capturing all realistic looking shots. What that means is that wherever computer effects might have been used in this film, you can’t really tell. Everything looks perfect. And I love the blue blood. It just looks super cool and gooey and synthetic. The movie is great up until the final ten minutes or so. That’s when it finally starts lacking. It’s a scene involving a light in the sky that just goes on for way too long. So long that we actually start to tune out of the movie. But other than that one lengthy scene, the movie is pretty great. Everything else about it works. The humor and story are both pretty good, and the action is very well done. Edgar Wright is a fantastic storyteller, and with this movie he proves it once more. They are calling these three films (Shaun of the dead, hot fuzz, and the worlds end), the cornato trilogy, named after a popular British ice cream that appears in all three films. 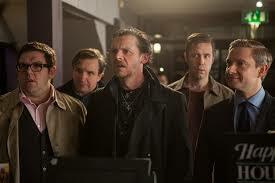 The worlds end is certainly a great addition to the trilogy and it fits right in with those others, perfectly.